The Japan Patent Office has granted the patent JP6285012B2 “Immunogenic complex for vaccination and method for the production thereof” requested by INMUNOTEK. This patent refers to the new glycoconjugates with mannan developed by INMUNOTEK for the design of novel vaccines targeting dendritic cells. 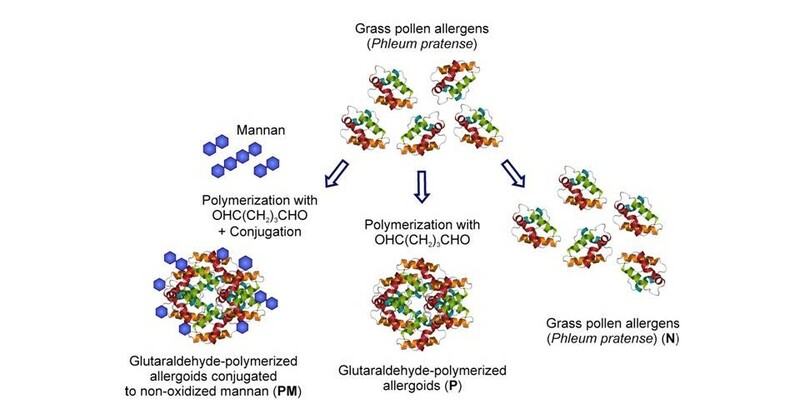 Allergoids can be coupled to mannan improving their bioavailability for allergy immunotherapy and producing positive immunomodulatory effects. The invention is the result of an INMUNOTEK research project that has received funding from the Center for Industrial Technological Development (MINECO, Spain) and the collaboration of researchers from the CIB-CSIC and Complutense University (Madrid). Currently, these vaccines are at the clinical development stage.